So since we’re in the Southern Hemisphere our school has been wrapping up here over the past few weeks and the heat of summer is now fully upon us! Here are a few highlights from the end of the year. Institute Graduation: Tom and I didn’t have a big role to play in this graduation, Tom was going to take some pictures and provided some technical support that day. So, we sauntered over at 7:05 (it was supposed to start at 7:oopm). No one was there. So we hung out some more and wandered over again at 8pm. This time everyone was there milling around and Madre Clara hustled over to us as we walked in with her usual, “Tomas, fotos.” Tom is her official photographer now. Then she turned to me and said “Laura can you do me favor? Will you be the madrina for my two nephews?” and she motioned towards two young men. I said, “Sure but should I change clothes?” and she says, “Yes something more elegant.” So I run back to our house and hurriedly put on a black skirt and sparkly top. So I should explain, in Bolivian graduations each graduate is called by name and walked down the aisle by a parent or god-parent (who’s name is also called). “This is Laura Alice Kent escorted by her husband Thomas Martin Kent” for example. So I got to walk the two guys, Javier and Richard, down the aisle! Richard, Me, Javier, Madre Clara. Javier was taking it a little more seriously. 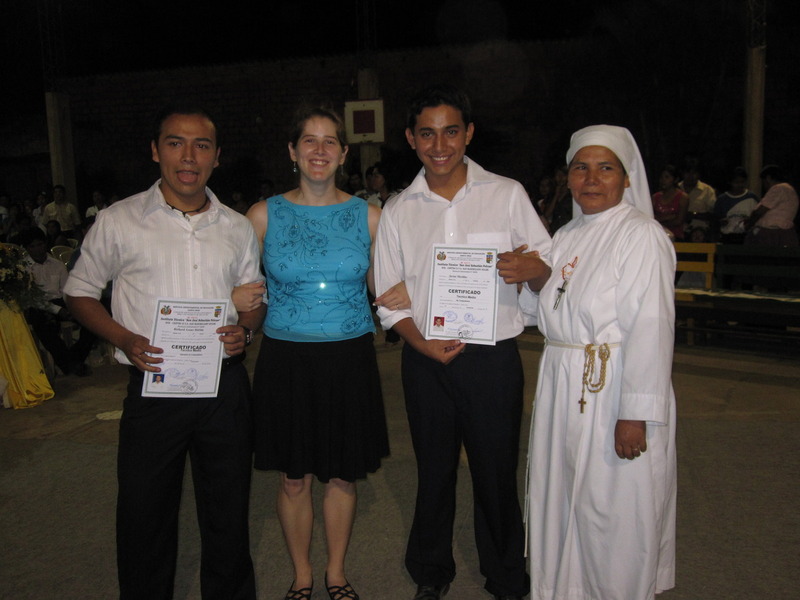 Then, if this wasn’t enough, when I went to sit down with all the other families Madre Clara grabs me and says, “Can you help hand out the certificates?” and pulls me to the stage. The people on stage were the Provincial, Madre Christina, the Madre General from Poland, and the actual professors. I don’t know why I was there! But as soon as I get there a professor hands me a certificate and I have to go and present it. I was all prepared for the shake with the right, receive certificate with the left but it’s much more complicated here. All the women are holding flowers and sometimes teddy bears so they can’t really shake your hand and you have to give them a kiss also, sometimes on one side, sometimes on both sides and then hand them the certificate. And you have to congratulate their accompanying person also and some of them wanted to kiss me too. I kissed some of older men, I don’t know if I was supposed to do that or not. It was very culturally awkward. Here women are often greeted with a right cheek to right cheek air-kiss – by women and men. It seems to be very common, and not just among friends. I’m still trying to figure out the custom and get used to it. Glad to hear you both are integral parts of the life of the Institute!